Kalki Avatar is the future incarnation of Lord Vishnu, which is yet to arrive. Story of Kalki Avatar is mentioned in Puranas especially Srimad Bhagavad Purana and Kalki Purana. It is the future avatar of Vishnu and it will put an end to this particular cycle of creation. Since the world has gone utterly corrupt with adharmic activities, it is believed the Kalki Avatar will bring an end to the present cycle of the universe and after a span of darkness creation will begin once again. It is said in Bhagavad Purana that he will appear in Sambhala village. Kalki is usually depicted riding a horse with a drawn sword. Lightning, thunder, heavy rain and harsh sun are frequently associated with this avatar. As per the popular version of the story, the end of Kali Yuga will see even the pious neglecting the Lord. The sufferings of those follow Dharma will become unbearable. Lord Vishnu will appear as Kalki as the son of Vishnuvyas in the village of Sambhala. 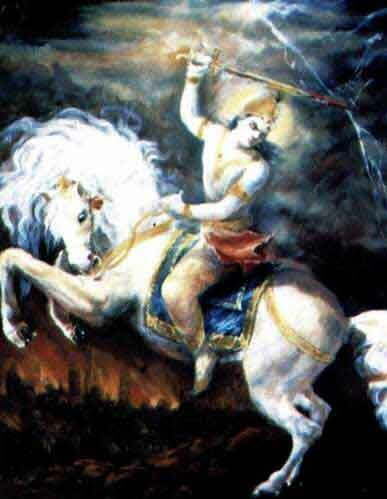 Riding a white horse with a drawn sword, Kalki will mow down the evil and corrupt and ensure the reign of Dharma. By the time of the Kali Yuga ends (present era as per Hinduism), the bodies of all creatures will be greatly reduced in size, and the religious principles of Varnasrama will be ruined. The path of the Vedas will be completely forgotten in human society, and so called religion will be mostly atheistic. The kings (rulers) mostly will be thieves; the occupation of men will be stealing; lying and needless violence; and all the social classes will be reduced to the lowest level. Cows will be killed, spiritual centers will be no different from mundane house, family ties will extend no further than the immediate bonds of marriage. Most plants and herbs will disappear. Seasons will go awry, homes will be devoid of piety and there will be no morality. At that time, the Supreme Personality of Godhead will appear on the earth. Acting with the power of pure spiritual goodness, He will rescue eternal religion.